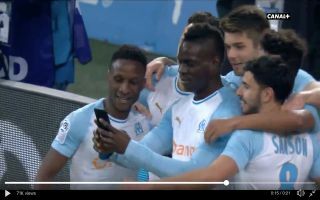 Balotelli scored in the 12th minute of Marseille’s clash against St. Etienne, Balotelli scored a scissor kick from close range after a lovely corner from former Newcastle winger Florian Thauvin. Scoring acrobatically wasn’t enough for the Italian, the former Manchester City ace then ran to a cameraman to get his phone, the 28-year-old then filmed a selfie video with his teammates which he uploaded to his Instagram story. What a goal from Balotelli ! Let it be known that Mario Balotelli never ceases to amaze.